Is this ancient moon rock from Earth? An intriguing ancient rock found on the moon and brought back by the Apollo 14 mission may actually have originated from Earth, a new study says. 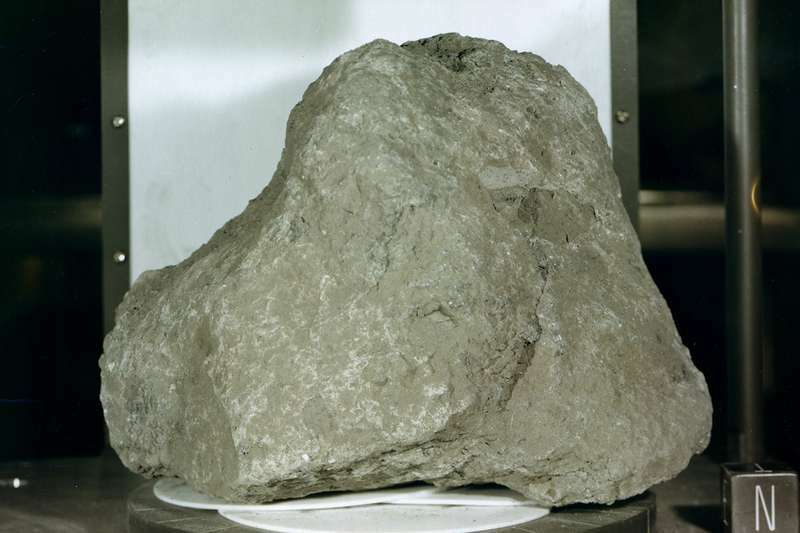 Part of this rock is granite composed of quartz, feldspar, and zircon crystals – all common on Earth but rare on the moon. Did it originate from Earth? Image via NASA. What would be the best place to look for the oldest known rocks on Earth? Deep underground? The bottom of the ocean? As it turns out, the ideal location might be … the moon! An international team of scientists associated with the Center for Lunar Science and Exploration (CLSE), part of NASA’s Solar System Exploration Research Virtual Institute (SSERVI), have reported the oldest known Earth rock might have been in a sample returned from the moon by Apollo 14. The peer-reviewed discovery has been published in the journal Earth and Planetary Science Letters. It’s thought that the rock was jettisoned off the Earth by an impacting asteroid or comet, eventually colliding with the moon about 4 billion years ago, during the Hadean eon. At the time, the moon was about three times closer to Earth than it is now, making that even more of a possibility. We usually tend to think of meteorites – from the moon or an asteroid – impacting Earth, but the team, led by Research Scientist Jeremy Bellucci and Professor Alexander Nemchin, wanted to try to locate pieces of Earth rocks that had impacted the moon. The team, based at the Swedish Museum of Natural History and Curtin University in Australia, found what they were searching for – a two-gram fragment of granite rock containing quartz, feldspar and zircon crystals – all common on Earth but highly unusual on the moon. It is an extraordinary find that helps paint a better picture of early Earth and the bombardment that modified our planet during the dawn of life. If it formed on the moon, it must have formed 167 kilometers [104 miles] deep. Even a massive impact on the moon would not be able to dig up rocks from that far down. Earth’s been hit by a lot of very big things, and it’s conceivable that some of those impacts have ejected material far enough away that it’s been able to escape the clutches of Earth and make it to the moon. What they’ve pointed out is an interesting inconsistency and they’ve pointed out a possible hypothesis, and now we get to figure out whether it holds water or not. Bottom line: It’s been known for a long time that pieces of the moon can be blasted off the surface during impacts and then later hit the Earth as meteorites. This new study now provides evidence that the opposite can also occur – bits of rock from Earth can also end up on the moon – waiting to be discovered by future human or robot explorers. Near the end of 2018, a startling claim made international headlines: “Pilots report seeing ‘very fast’ UFO above Ireland,” CNN reported. “If it wasn’t aliens, what was it?” The Washington Post asked. News of the unidentified flying object flew across the globe like a meteor, which is what the mysterious entity most likely was, according to aviation and astronomy experts. As is often the case, that tidbit was buried at the bottom of most news stories. UFO sightings are reported to local authorities or volunteer UFO groups with varying degrees of fanfare. A recent visit to the Mutual UFO Network (MUFON) website features sightings logged from Canada to Mississippi. A pilot in Alabama reported seeing an “oddly shaped circular object” in 2017. A camper in Idaho spotted a “massive triangular craft” last summer. People who claim to see UFOs are typically adamant about what they witnessed, though most space experts are unconvinced. “No serious astronomer gives any credence to any of these stories,” astrophysicist Martin Rees notably said in 2012. He’s right. UFO reports can be attributed to commercial or military jets, weather balloons, an odd cloud formation, a comet, or Venus (under certain atmospheric conditions, the planet can appear as a fast-moving, bright halo). Some intrepid photographers have even confused insects flying around a camera lens for alien aircrafts. The truth is, the number of reported UFO sightings have actually “fallen significantly in recent years,” says Peter Davenport, director of the Seattle-based National UFO Reporting Center, whose organization keeps a monthly tally. Sightings have fluctuated for decades, peaking in 2014 with 8,619 documented reports of UFOs. In 2018, 3,236 sightings were recorded. America’s fascination with UFOs, however, isn’t going anywhere, much to the chagrin of scientists who thought we’d left our collective extraterrestrial frenzy behind decades ago. Since the first publicized UFO sighting by a private pilot named Kenneth Arnold in 1947 — he reported spotting “nine bright saucer-like objects” while flying his plane in Washington state — extraterrestrial contact has served as a Hollywood muse and continuous source of media fodder. Today, Ancient Aliens, a controversial pseudo-documentary series that argues space aliens shaped humanity, is the History Channel’s most popular show. Recently, the network unveiled “Project Blue Book,” a new show based on the U.S. Air Force’s investigation into UFOs during the 1950s and 1960s. Another upcoming TV series, based on “real life” UFO events at a U.S military base in Britain, is being produced by Sony. Yet given the consensus among scientists that space aliens aren’t visiting Earth, it’s tough to understand how reports of a UFO streaking across Ireland makes news headlines with little skepticism. Until recently, the topic had largely been relegated to the tabloids and fringe outlets. A major impetus for the resurgent interest in UFOs from news organizations can be traced to a December 2017 front-page article in the New York Times, which revealed that the U.S. government had, in the recent past, spent $22 million on a secretive project run by the Pentagon to research and assess “the threat posed” by UFOs, according to the piece. The Times story set off a flurry of wide-eyed coverage in prestigious mainstream organizations such as NPR, CNN, and every other major broadcast news outlet. The reports suggested that the military is taking UFO sightings seriously, even if scientists are not. Such prominent attention from the press sends a signal to the public, says Glenn Sparks, a communications professor at Purdue, who studies how beliefs and emotions are influenced by the media. “If UFOs are getting credible news coverage, and the news media are taking it seriously, that is likely to have an impact on how the average person might think about it,” he says. This media coverage, he adds, also fuels an already robust entertainment market for the topic. Understanding our latest round of extraterrestrial fervor requires an awareness of how UFOs became woven into the fabric of American culture in the first place. While Hollywood certainly has played an influential role, I argue it’s the news media that keeps the specter of extraterrestrials alight in our skies and minds. America’s cultural fascination with UFOs is well established. Iconic films like Close Encounters of the Third Kind and popular shows such as The X-Files have fed this curiosity. Additionally, television stations — particularly cable networks like the History Channel, Discovery, and National Geographic — have provided “a steady supply of sympathetic documentaries about UFOs and alien contact” for decades, says Penn State historian Greg Eghigian in a 2015 paper. As it happens, research suggests that UFO sightings have periodically spiked after the release of popular sci-fi flicks, such as Independence Day and Steven Spielberg’s remake of War of the Worlds. Hundreds of similar mysterious objects were reported in the following weeks and months across the United States. “Flying Saucers Seen In Most States Now,” read one headline from the San Francisco Chronicle on July 7, 1947. This rash of UFO sightings occurred at an edgy time in American history: Japan’s surprise attack on Pearl Harbor was still fresh in the national psyche and the Soviet Union’s nuclear ambitions were beginning to spook Americans. It was in this “fertile milieu in which the phrase ‘flying saucer’ would quickly lodge in the public imagination, where it began to crackle like a low-grade neon sign,” Thompson writes. Meanwhile, government officials struggled to calm citizens — and make sense of what was happening. In public statements, the Pentagon sought to downplay the sightings, but within some parts of the military, there were real concerns and confusion. At first, the frequency of sightings and similarity of their descriptions led Air Force investigators to wonder: Could some of the disc-like objects be extraterrestrial in origin? Instead of putting the matter to rest, as the Pentagon hoped, the article aroused ire and disquiet. Concerned that its public engagement was feeding into the country’s “war nerves,” the Pentagon resolved to go silent on UFO commentary. Into this vacuum stepped a group of citizen crusaders, rank opportunists, and con artists. One leading voice was retired Marine Corps Major Donald Keyhoe, who in January of 1950 published a widely circulated article in True Magazine titled, “Flying Saucers are Real.” UFO sightings were soon taken up by mainstream media’s most iconic and influential publications. In 1952, Life Magazine published a lengthy article titled, “Have we visitors from outer space?” This was a watershed moment, writes Mark O’Connell in his recent book, The Close Encounters Man. “When Life spoke, the whole country listened,” he writes. Hollywood, of course, also seized on the craze. In 1949, a Hollywood writer named Frank Scully published several columns in Variety that claimed the government was in possession of crashed saucers and alien corpses. (A few years later his sources were revealed to be hoaxers.) Numerous alien films were released over the next 10 years, including The Day the Earth Stood Still, Invaders from Mars, Earth vs. the Flying Saucers, and Invasion of the Saucer Men. By the late 1960s, America’s UFO phenomenon was in full bloom. There were flying saucer cults, UFO-monitoring organizations, and more UFO sightings covered widely in the press. In 1966, five percent of Americans told a Gallup poll they had seen something resembling a UFO. In the same poll, “nearly all Americans — 96 percent — said they had heard or read about flying saucers,” writes Gallup analyst Lydia Saad. If only that were the end of the story. Today, a new set of crusading actors are reviving a UFO narrative with all the trappings of America’s first round of extraterrestrial enchantment. On December 16, 2017, Politico, the New York Times, and the Washington Post published near simultaneous stories about an obscure $22 million Pentagon project that officially existed between 2008 and 2012. All three outlets had essentially the same story: The Pentagon program was created at the behest of former Democratic Senator Harry Reid in 2008 and was run jointly for a time with Bigelow Aerospace in Las Vegas, whose owner, Robert Bigelow, has long been on the hunt for extraterrestrials and poltergeists. Politico and the Washington Post treated the Pentagon program as it appeared to be: A pet project of a senator that didn’t amount to much — other than “reams of paperwork” — and did not provide evidence that alien spaceships were buzzing our skies. Both stories had well-placed sources in the intelligence community that were skeptical of the program’s purpose and deliverables. Absent any salacious details, neither story got wider pickup. The New York Times, however, played up dubious tidbits that the Washington Post or Politico either didn’t find credible or simply didn’t know about — namely that the program had found “metal alloys and other materials… recovered from unidentified aerial phenomena,” that got stored in a Bigelow Aerospace warehouse. There is no indication in the Times story that any of these “materials” were seen firsthand by its reporters. The Times also had something its competitors apparently didn’t: Grainy footage of two Navy F/A-18 fighter jets in 2004 tracking an apparent unknown object “traveling at high speed and rotating” off the coast of San Diego. The 45-second video and the Times front page article went viral. But there’s more to the Times story that should’ve given readers pause. One of the authors of the story was Leslie Kean, a journalist with a long-standing interest in UFOs and the paranormal, who published a book in 2010 titled, UFOs: Generals, Pilots, and Government Officials Go on the Record. At the time, activists in the UFO community were coalescing around the goal of obtaining official “disclosure” about extraterrestrial sightings. This entailed finding current military and aviation whistleblowers to come forward and share the secrets they knew about UFOs — or in the case of Kean’s book, tell of the strange flying objects they had seen or learned about in the course of their jobs. In numerous articles in the Huffington Post over the past decade, Kean has discussed her participation in several nonprofit groups involved in UFOs and the “disclosure” movement. On Oct 10, 2017, Kean published a tantalizing article on the Huffington Post’s contributor platform. (The platform, now closed, allowed people to post their own writing to the site). “Something extraordinary is about to be revealed,” she wrote. “Former high-level officials and scientists with deep black experience who have always remained in the shadows” were preparing to dish “inside knowledge” of UFOs. Kean described a group of “government insiders” that had come together as part of a new for-profit company called To the Stars Academy of Arts & Science (TTSA). Members included Hal Puthoff, a theoretical physicist and former Scientologist who directed the infamous “psychic spy” program for the CIA and DIA (Defense Intelligence Agency) in the 1970s and 1980s, and Chris Mellon, a former Deputy Assistant Secretary of Defense for Intelligence during the Clinton and George W. Bush Administrations. The Times, encouraged by Kean, took a serious look at Elizondo and his claims. Other prominent outlets, it turned out, were doing so, too. Two months later, the Times, Politico, and Washington Post stories hit. But it was the Times piece that reverberated across the media landscape. These criticisms hardly registered, though. If anything, the juggernaut grew after Elizondo and TTSA in 2018 rolled out more intriguing videos, obtained from the Pentagon, of supposed UFOs under pursuit by military jets. It launched another news cycle, once again with few skeptical voices in the media. Actually, you can thank the news media. NASA's Hubble Space Telescope has uncovered another mysterious dark storm on Neptune and provided a fresh look at a long-lived storm circling around the north polar region on Uranus. During its routine yearly monitoring of the weather on our solar system's outer planets, NASA's Hubble Space Telescope has uncovered a new mysterious dark storm on Neptune (right) and provided a fresh look at a long-lived storm circling around the north polar region on Uranus (left). 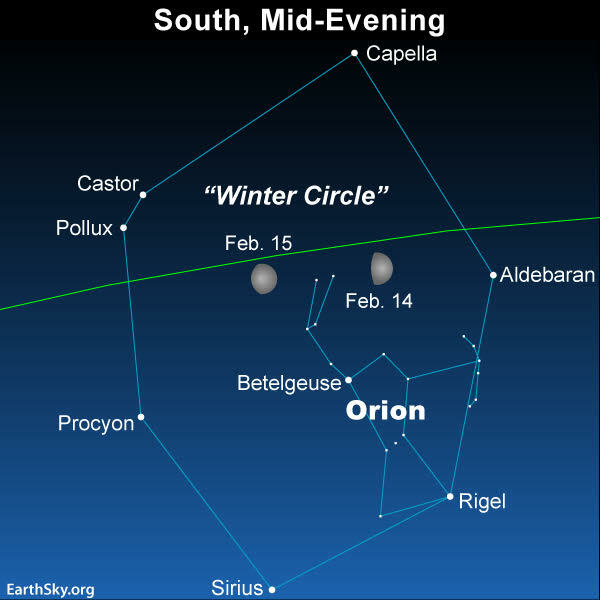 On February 14 and 15, 2019, you’ll find the waxing gibbous moon shining inside a large asterism that we in the Northern Hemisphere often call the Winter Circle. It’s a very large star configuration made of brilliant winter stars. Around the world on this night, the moon shines inside the Circle. From anywhere in the Northern Hemisphere, look for this pattern to fill up much of the eastern half of sky at nightfall. At 8 to 9 p.m., the Winter Circle will swing to your southern sky, and then it will drift into your western sky around midnight. If you’re in the Southern Hemisphere … although it’s not winter for you, these same stars appear around the moon. But, for you, the Circle will appear upside-down with respect to our chart. The star Sirius will be at the top, instead of the bottom. The Winter Circle is sometimes called the Winter Hexagon. It’s not one of the 88 recognized constellations, but instead an asterism – a pattern of stars that’s fairly easy to recognize. Our sky chart can’t adequately convey the Winter Circle’s humongous size! It dwarfs the constellation Orion the Hunter, which is a rather large constellation, occupying the southwestern part of the Winter Circle pattern. Last edited by ilan; 02-14-2019 at 01:20 PM. Happy 455th birthday to one of the first modern scientists, Galileo. With the aid of an early telescope, he helped remove Earth from the center of the universe. 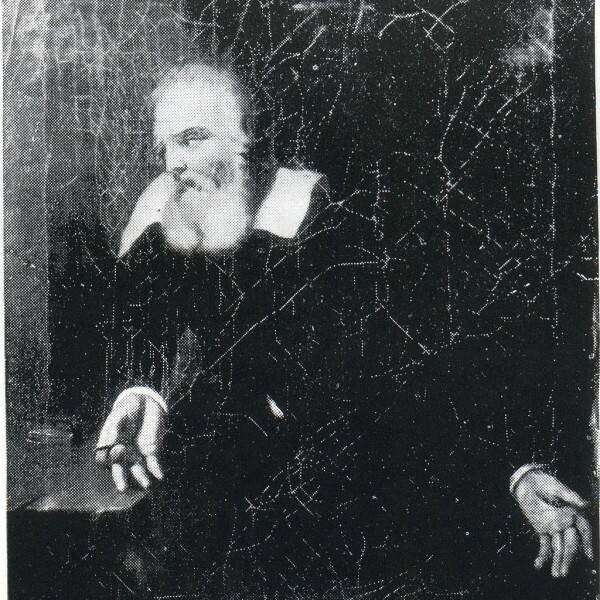 Portrait, attributed to Murillo, of Galileo gazing at the words “E pur si muove” (“And yet it moves;” not legible in this image) scratched on the wall of his prison cell. Image via Wikimedia Commons. February 15, 1564. On this date, Italian astronomer, mathematician, and physicist Galileo Galilei was born. He is one of the first people on Earth to have aimed a telescope at the heavens, where he found – among many other things – phases for the planet Venus and four starry points of light orbiting the planet Jupiter. In Galileo’s time, educated people subscribed to the Aristotelian view that Earth lay fixed in the center of a more or less unchanging universe. Thus the discovery of moons orbiting Jupiter (now called the Galilean satellites) and revelation that Venus must orbit the sun, not the Earth, were considered heresy by the Roman Inquisition. In 1633, the Inquisition forced Galileo to recant. He spent the rest of his life under house arrest. E pur si muove (and yet it moves). The phrase is still used today as a retort, implying it doesn’t matter what you believe; these are the facts. Galileo grew up in a musical family. In 1574, the family moved to Florence where 18-year-old Galileo began his education in a monastery. He was very successful in his studies, and began studying medicine at the University of Pisa. Due to financial problems, he was unable to finish his degree, but his years at the university were priceless. They introduced him to mathematics and physics, but most importantly, they introduced him to Aristotle’s philosophy. Back then, if somebody wished to know about the universe, the way to do it was to read Aristotle’s works. As Dante had put it some centuries before, Aristotle is “the Master of those who know” (Dante, Inferno 4.131). In other words, at that time, knowledge was to philosophy what faith was to religion. And so, in spite of not being able to complete his degree in medicine and become a university professor, Galileo still continued his studies of mathematics. He was able to get a few minor teaching positions for a living. After two years of hard work, he published La Bilancetta (The Little Balance), his first scientific book which gained him a reputation. The book commented upon the story of how the king of Syracuse asked Archimedes to verify whether his crown was made of pure gold or a lower-value mix of metals. Galileo presented an invention of his, the “little balance,” today called “hydrostatic balance,” that is used to make more accurate measurements of differences in density. Galileo’s reputation was bruised after the publication of his Du Motu (On Motion), a study of falling objects, which showed his disagreement with the Aristotelian view about the subject. In 1609, he heard word that in the Netherlands, an instrument had been invented that showed distant objects as if they were close by. Like many others, Galileo quickly figured out the mechanics of the spyglass, but later on he greatly improved the original design. He presented the Venetian State with an eight-powered telescope – a telescope that magnifies normal vision by eight times. His telescope earned him a doubling of his salary and a life tenure at Padua University. Over the years, Galileo improved his telescope to magnify up to 20 times. With his telescope, he made many astronomical discoveries. For example, he was the first to view the moon magnified 20 times. He drew the moon’s surface, showing that its surface is bumpy and rocky, contrary to the popular belief of the time that the moon was smooth. In January 1610, he discovered the four most massive moons of Jupiter: Io, Europa, Ganymede, and Callisto. Today, they are referred to as the Galilean moons. He laid out all of his findings in his book Siderus Nuncius (The Sidereal Messenger). Galileo observed that Venus went through phases, just as the moon does. Galileo was a very respected man by 1610, but his increasingly public acceptance of the heliocentric system began to cause him trouble with the Roman Catholic Church. In 1618, Galileo was dragged into a controversy about the nature of comets, which was of no help to his social position. Galileo nevertheless published the argument under his own name in Il Saggitore (The Assayer) in 1623, which is to this day one of his best known pieces of work. Things didn’t get much better for Galileo before his death in 1642. His work kept defying the accepted Aristotelian view, and earned him the anger of the Roman Catholic Church, which centuries before had founded a group of institutions within the Church’s judicial system – known as the Inquisition – whose whose aim was to combat heresy. In particular his 1632 publication of his Dialogue Concerning the Two Chief World Systems, Copernican and Ptolemaic opposed the Aristotelian view. In 1633, the Inquisition summoned Galileo to Rome. He was declared a suspect of heresy, was punished by life imprisonment, and was made to abjure formally. Nevertheless, he lived comfortably and was allowed to continue his work. Galileo never stopped working. In 1634, his beloved elder daughter, Virginia, died. He was 70 years old. He decided to finish what he started before the telescope interrupted him. He collected and finished his unpublished studies, and in 1638 published them in Dialogues Concerning Two New Sciences, discussing kinematics and the properties of materials. A list of all of Galileo’s discoveries is a very lengthy one. Although Galileo is greatly praised for his various scientific discoveries, he did much more than just push science forward: he also pushed society forward. His life was much more than just a conflict with religion and Aristotelianism. It was a fight against the suppression of the opinion of an emerging scientific minority. Galileo was one of the first to free science from philosophy. He inspired countless others to pursue the freedom of scientific enquiry. Bottom line: Galileo was born on February 15, 1564. He was one of the first to aim a telescope at the heavens, thereby showing that Earth is not the center of all things in the universe. As he tells it, his life story sounds like a cerebral version of “Forrest Gump” — Loeb always single-mindedly pursuing his science and intersecting with the giants of the field, whom he regularly name-drops. Stephen Hawking had dinner at his house. Steven Spielberg once asked him for movie tips. Russian billionaire Yuri Milner once walked into his office and sat on the couch and asked him to help design humanity’s first interstellar spaceship — which he is now doing, with a research budget of $100 million and the endorsement of Mark Zuckerberg and the late Hawking. of the planet's rocky surface. Mercury returns to the evening sky in mid-February. Tonight, it appears 5° high in the west-southwest 30 minutes after sunset. The planet shines at magnitude –1.1, bright enough to show up against the twilight glow. (If you don’t see Mercury right away, binoculars will bring it into view.) A telescope will reveal the planet’s disk, which spans 5.6" and appears nearly full. The inner world is currently embarking on what will be its finest evening appearance of 2019. A week from now, it will appear twice as far above the western horizon a half-hour after the Sun goes down. An Illinois witness at Saint Charles reported watching a cigar-shaped object moving overhead with lights at both ends, according to testimony in Case 89610 from the Mutual UFO Network (MUFON) witness reporting database. The witness and her husband were looking out a front kitchen window about 9:30 p.m. on January 3, 2018, when the incident began. The witness then alerted her husband. Illinois MUFON State Section Director James Wolford closed this case as an Unknown Aerial Vehicle.